A dog which is well known for its loyalty, honesty and guardian nature is none other than Bullmastiff dog. 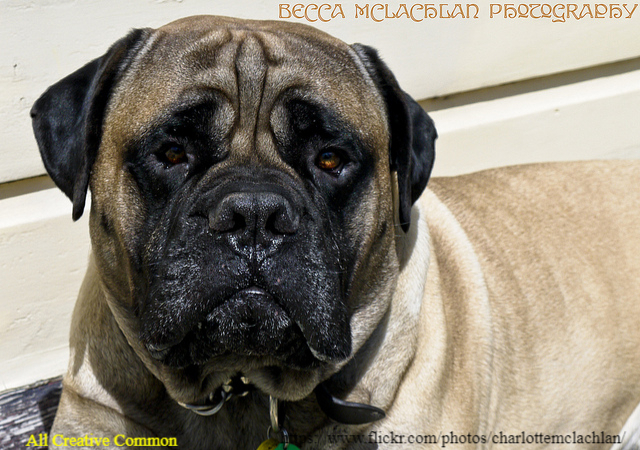 This favorite breed of dog was originated in Great Britain by the crossing of Mastiff dog and Bulldog. Bullmastiff dog is the popular pure-breed which contains 60% traits of a Mastiff dog and 40% traits of Bulldog. Till 1924, it was thought to be a pure breed by the English Kennel Club. The coat color of this breed is a matter of attention for a number of people. Most common colors of this Bullmastiff dog are fawn, red and brindle. These acceptable coat colors of Bullmastiff dog provide a huge margin of selection to the pet lovers. No guide is complete without the lifespan of the breed. Hence, the knowledge about the expected lifespan and the rights ways to ensure a better quality of pet’s life should be known to the owner, both new and old owners. Awareness about it an make a huge difference. One can enjoy a more long-lasting relationship with their pets by having a fair idea about their pet’s lifespan. Just like humans, they also have an average lifespan which can be extended to the extra attention and care. On contrary to this, it can be decreased by negligence. Majority of the people considers the average lifespan of Bullmastiff dog to be 7 years. Let us have a glimpse of the most accurate average lifespan of Bullmastiff dog which is estimated by taking a huge data on the dog’s age from different parts of the world! The life expectancy of dogs varies from breed to breed. Some of the breeds live more life than the others while a few breeds of dog depicts shorter lifespan. Enormous factors are involved in the life expectancy of a Bullmastiff dog. The more a healthy a dog would be, the more lifespan it would enjoy. Not merely long lasting life is considered to be the best parameter for the selection of a pet. Both lifespan and quality of life play a key role in the selection of desirable pet. The average lifespan of your beloved Bullmastiff is considered to be 8.6 years. Bullmastiff life expectancy mentioned here is tentative. Sometimes, they may exhibit to either live a few more years or a fewer year less than the average lifespan of Bullmastiff dog. Hence, the purpose of an average life expectancy is to provide an idea of the expected time when your brave and loving dog could say goodbye to you forever. Knowing the details of the lifespan of the pet allows the owner to be prepared for the farewell. Hence, they can contribute well to the health, wellness, and happiness of their dog. This fair idea allows owners to enjoy a life full of excitement and thrill with their favorite pet. A male Bullmastiff dog giant, muscular and massive in appearance. It is known for its strength and power. People explore much to buy the Bullmastiff dog which appears to be giant. Having a male Bullmastiff dog at the home ensures a high level of protection. Owners need to be much focused to know about the primary desires and needs of their pet in order to its basic needs and requirements. The average lifespan of male Bullmastiff dog is 8 to 10 years. Bullmastiff dog is such a kind of dog breed which is prone to a number of diseases. Ensuring balanced diet, proper exercise and healthy living activities make your dog live with full satisfaction and enjoyment. Poor quality of life can be minimized by taking good care of pet’s health. A male Bullmastiff dog weighs 50k to 60kg (110-133 pounds). Exceeding from their weight range leads to obesity and weight less than this weight range indicates to the health disorders. Keep on monitoring the weight of your Bullmastiff and take it to the veterinarian when you find any sudden abnormality in its weight. Just like the male Bullmastiff dog, the average lifespan of the female Bullmastiff dog lies between 8 to 10 years. Its weight usually ranges from 45kg to 54 kg (100-120 pounds). Female dogs are also concerned about the protection of their owners and family. They leave no stone unturned to please their master. Bullmastiff dog is quite friendly to the kids. Their training and socialization should be started at the early age. These are amazing to be introduced to the gathering because of their well-mannered behavior and habits. The average lifespan of Bullmastiff dog gets shortened due to the diseases such as lymphosarcoma, hip dysplasia, elbow dysplasia, osteosarcoma, hypothyroidism, mast cell tumors, sub-aortic stenosis, cardiomyopathy, and hemangiosarcoma. The longest living Bullmastiff dog age is usually 12 years and sometimes more. Although usually, they kick off the bucket at the age of 8 to 10 years. IT is obvious that Bullmastiff dogs are at higher risk of many of the genetic diseases. Owners need to take sagacious steps in this regard. No matter, either the disease is genetic or not, owners should try to ensure the proper diagnosis of their pet’s disease at an early stage. Early detection is beneficial as it brings an effective response to the treatment. Many of the diseases can be reversed through by the early diagnosis. Owners should take their pets to the veterinarian for the regular checkups. The medical test should be ensured on a yearly basis when the abnormal signs and symptoms are observed. Blood test provides the diagnosis of various diseases such as different types of cancers. Addressing these health issues properly is of great significance. 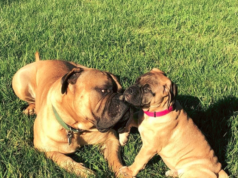 The factors contributing to the longer lifespan of Bullmastiff dog are nutrition, physical activity, mental activity, good dog care, proper protection in unpleasant and harsh weather, regular checkups and exercise. It is observed that the dogs which are taken to the vet for the regular checkups exhibit longer survival rate than others. If their health is taken for granted or they are subjected to poor care then it may lead to serious outcomes such as early death or worsening of the disease.